The unique Helikite, the world’s only successful lighter-than-air kite. Harnessing both the pure, reliable lift of helium and the raw power of wind, the Helikite has unrivalled payload performance. Twice the load bearing ability of similar sized blimps. Even the smallest Helikites fly superbly in high winds. Stability is ensured by the aerodynamic design, the stiff carbon-fibre spar and the relatively high gas pressure. How high do you wish to go? Helikites love to fly at high altitude. They get pushed up by both gravity and wind. Tether weight and drag is very low. All Helikites will fly to thousands of feet. Few Helikites are ever pushed to their altitude limit. From the very start Helikites were designed to fly unattended for extreme lengths of time in all weathers. Helikites are essentially aerial in habit and with their excellent helium holding ability they have great endurance. Why are Helikites so much More Efficient and Easier to use than Conventional Blimps? The wide shape of the Helikite gives useful aerodynamic lift. Powerful stability is provided by the kite with its keel and by the position of the helium balloon above the kite. The relatively fat balloon is 75% spherical. So the weight of the balloon envelope is minimised. The kite weighs little and provides the balloon with rigidity at lower pressures. The rounded balloon is a very strong elastic shape and is resistant to pressure changes. Helikites exploit both wind and helium to fly. 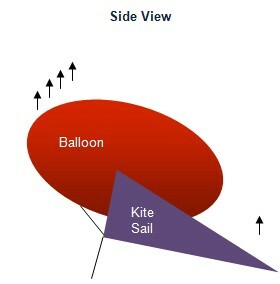 They use a balloon plus a specially designed kite with a long keel for stabilisation. The result - many times more lift than normal blimps for less helium. Helikites exploit wind very well, and will fly in a breeze even if they are weighed down to be heavier than air. This means that no extra helium is needed to fight the wind, which eliminates the need for 80% of the helium compared to normal aerostats. Also, higher wind speeds give more lift to Helikites so tether drag is not nearly so much of a problem because as the drag on the tether increases so does the lift from the Helikite to compensate. So, even tiny Helikites can fly to many thousands of feet in the slightest breeze. The fat rounded balloon is strong enough to take a good pressure of helium without bursting. So high winds do not distort it, as with a conventional blimp. Also, the kite spar lying along the bottom of the balloon creates a semi-rigid aerostat with the advantage of extremely good resistance to wind distortion. The simple oblate spheroid balloon is relatively easy to make, compared to the complex shape of conventional blimps and does not have their difficult sealing problems. The result is that leaking seams are very unusual with Helikites, whereas normal blimps often have this problem, especially as pressures increase. Helikites cope very well with pressure changes both within and outside the Helikite balloon. The rounded shape allows for relatively elastic material to be used for the balloon envelope, so it is capable of increasing or decreasing in size as required with little ill effect. The proprietary “Variable-Volume Bridle” allows flight up to 6000ft with no ballonet required. The solid carbon-fibre kite spar gives the Helikite some useful shape even if the balloon is low in pressure. So unlike conventional balloons, Helikites very seldom need ballonets, even when flying at great height. Simply fill the Helikite balloon for the average temperature and pressure likely to be encountered and the Helikites design will automatically cope with the pressure changes. This is a tremendous saving in complexity, cost, weight, helium and training of operator personnel. 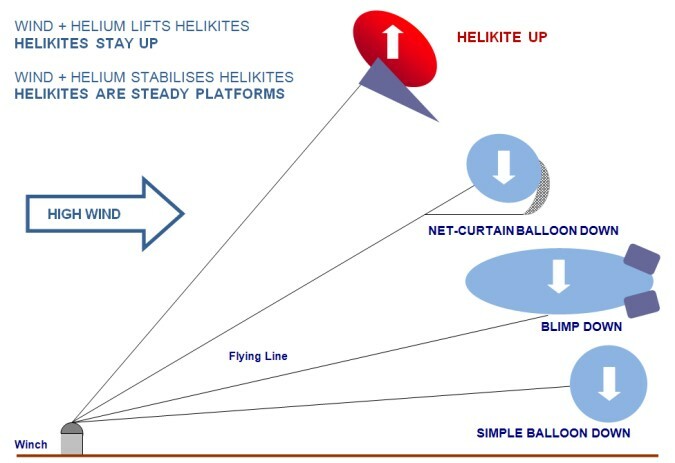 The Helikites sophisticated design allows it to lift many times the payload of conventional blimps for the same amount of helium and also enables it to fly in very high winds unattended. Helikites need only 5 m3 of helium to lift 1.5 Kg to about 3000 ft in no wind and 7,000ft in a breeze. An 11m3 Helikite will lift 5.5 kg in no wind and will lift 2 kg to about 7,000ft in a breeze Helikites fulfil peoples' expectations of lighter-than-air aerostats. This is why thousands are sold worldwide for a very wide variety of tasks, many of which were not possible before the advent of Helikites. Huge blimp aerostats of around 400 m3 or more, can fly in high winds if they are well designed and well maintained. This is because they utilise massive amounts of helium lift in the nose to counteract the de-stabilising effect of the wind. However, compact blimp aerostats do not have access to this huge amount of helium lift in the nose - but the wind is just as strong for them as it is for the massive blimps. So the classic blimp shape does not scale down as expected, which is why compact blimps do not perform well in wind. A well designed, massive, classic blimp is a good flying machine, when up. The problem is the immense cost, large helium requirement, high manpower and extensive space required. Also, they are very difficult to deploy and retrieve in high winds. Generally, a Helikite of about one quarter the size will do the same job. Larger Helikites are able to lift more, to greater heights and in higher winds, than smaller Helikites. Larger Helikites can be made that will lift considerably more. Please ask us for performance details if required. Lifting capacity does not include weight of line because this will vary with line length. * These figures are calculated estimates. Payload Attachment System (PAS) – This is a carbon-fibre stabilisation system designed for use with cameras. It enables the camera to be positioned steadily below the Helikite keel to give 360 degrees uninterrupted viewing. It will add about 30% to the weight of the camera payload. So a 1Kg camera will also need 0.3Kg of PAS. Material: Performance figures will vary if non-standard materials are used. Extreme cold: (below -15 deg C). These temperatures occur in high latitudes and sometimes at heights above 9,000 ft. In these situations there may be different balloon material used which may be heavier or cost more. Precipitation: Rain, snow and ice will reduce the lift. Smaller Helikites are affected far more than the larger ones. Temperature, pressure and density effects: These figures are for standard temperature and pressure. They are to be used as an approximate guide only. In areas of great heat or humidity there will be slightly less lift. Equatorial regions have thinner air which also reduces lift. Obviously, the air at altitude is thinner so it lifts less too. 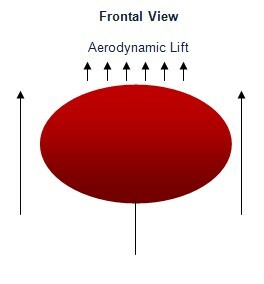 Air pressure affects the pressure of wind upon Helikites, so at high altitude a higher wind may be tolerated than lower down. Compared to standard blimps of similar sizes, the vastly greater performance of Helikites becomes obvious.